With just 3 ingredients, you will turn a cod fillet into a special, and oh so simple weekend dish. 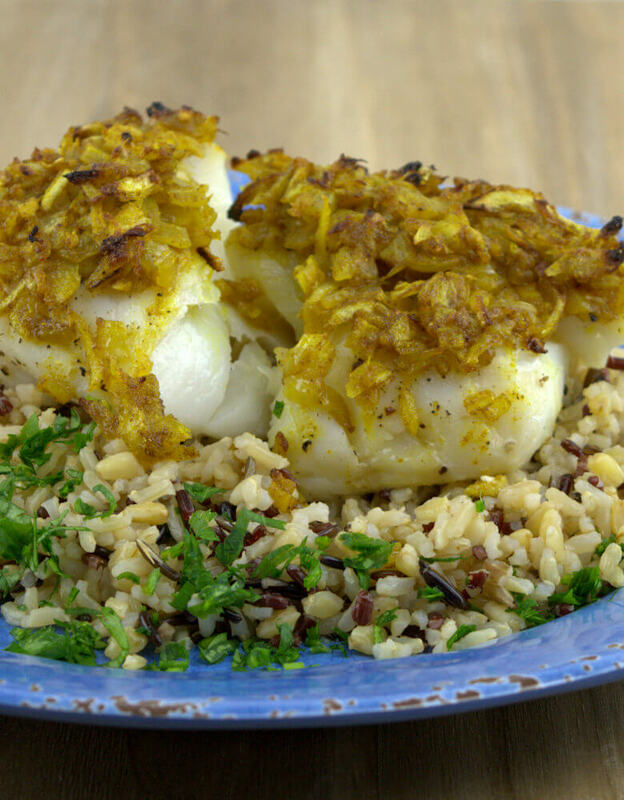 This Baked Cod with Onion, Curry and Ginger is a combination of a simple fish with a spicy, flavorful and colorful topping. Why do we eat fish? Hopefully, all of you, all of us eat fish because we like it; it is certainly the reason why I eat it. The added bonus is, that fish is healthy at the same time. 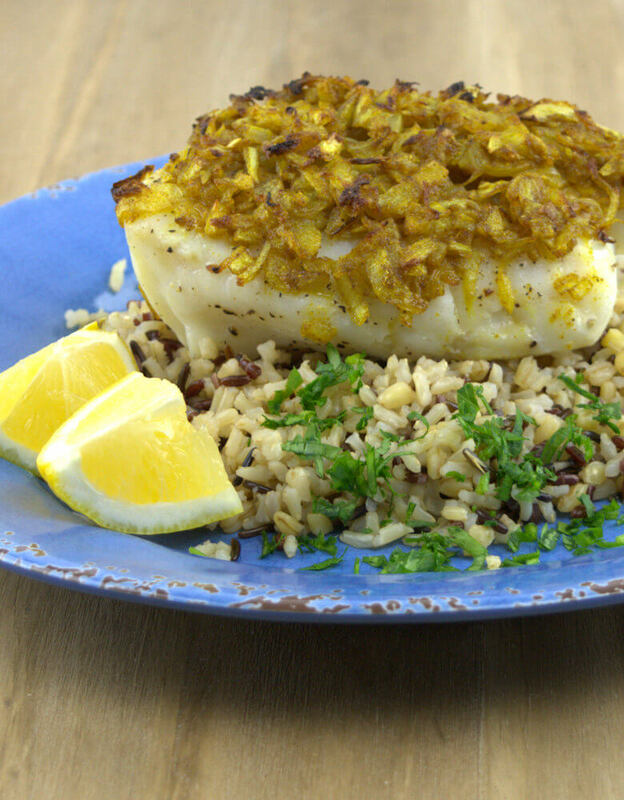 This recipe of Baked Cod with Onion, Curry and Ginger is still healthy after it is prepared. I just used a tablespoon of olive oil to prepare the onion, ginger and curry mix. No breading, no baking in butter; this recipe does not need that, to be flavorful. You won’t believe how easy this is to make; bake onions with ginger and curry power and place that on top of your fish fillet. Bake it in the oven until the fish is done and ….. voila ! Is that simple of what? 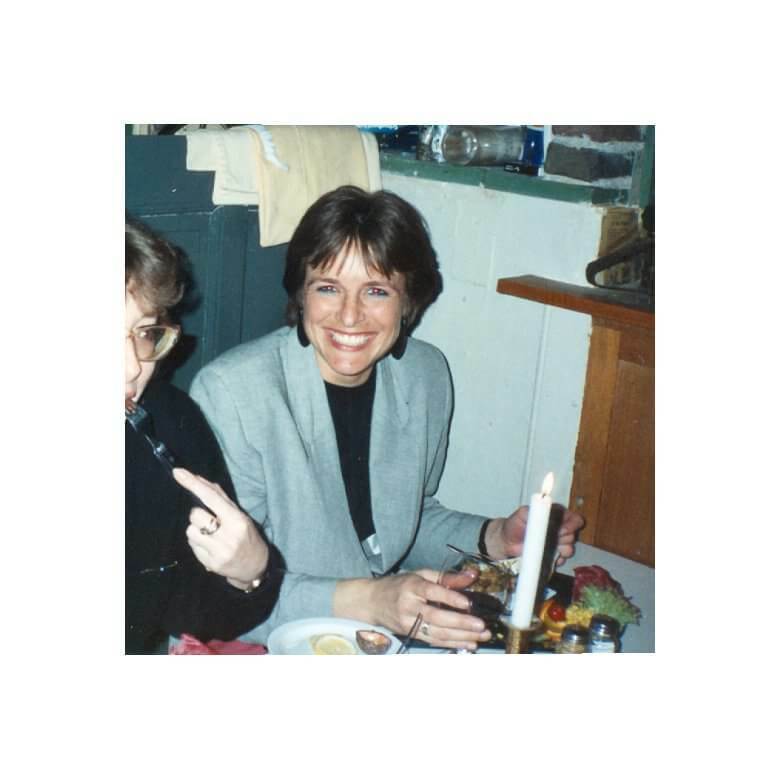 Serve it with some salad, green beans, traditional carrots, mashed or baked potatoes or a mix of whole grain rice, like it did. The rice mixture is just cooked, no added flavor; because of the variety of rice (long-grain parboiled brown rice, grano (pearled durum wheat), Colusari red rice, sprouted brown rice, wild rice. ), it is already flavorful and full of different textures. When you like it hot, select a hot curry in the onion, ginger, curry mixture. Heat a tablespoon of oil in a skillet, add the onions and the ginger and once that is translucent, add the curry powder. Bake a few minutes until the aroma arises from the mixture. The flavor of cod fillet is rather blend, pleasant, juicy, but blend. The spiciness of the topping with the flakiness of the fish make a nice combination. Try not to overcook the fish; it makes it tough and dry and takes all the fun out of eating cod. How do you tell whether you fillet is done. Raw fish is kind of translucent, while cooked fish is opaque and when you put a fork, of chop stick in the fish it should easily flake; pieces separate easily. The fish should also be shiny. How long does it take to get the perfect fish all depends on the thickness of your fillet. The cod I prepared was thick and I needed to bake it for 20 minutes. Thinner fillet may already be done in 10-15 minutes, so make sure you check regularly. 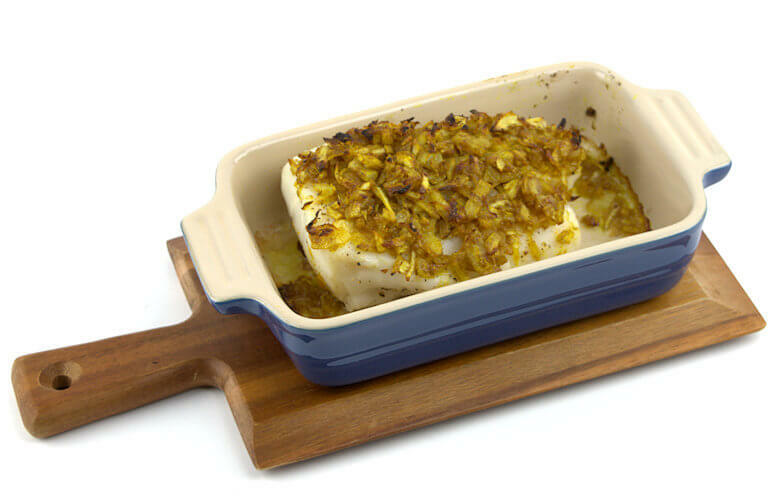 I encourage you to try this Baked Cod with Onion, Curry and Ginger. Simple and quick and delicious. Season the cod fillet or fillets with salt and pepper and place them into the baking dish. Sprinkle with lemon juice. Heat a tablespoon of olive oil in a skillet and add the onion and the ginger when the skillet is hot. Cook until translucent and add the curry. Cook for a few minutes and then place mixture on top of the cod fillet(s). Place baking dish in the oven (uncovered) and bake for 10-20 minutes. The cooking time will depend on thickness of fillet(s). Serve fillet on a plate with wedges of lemon.